Why did the French Army melt film during WWI? I have just watched the film Hugo which is in part a telling of the life of Georges Méliès. Part of the film is that he sold his films which were then melted down to make heels for shoes. I did some research on this aspect as it seemed very odd, and found out it was true! During the war, the French army confiscated over four hundred of Star Films original prints, melted them down to recover silver and celluloid, the latter of which the army made heels for shoes. Which again strikes me as odd... Was there really that much silver in celluloid in the film prints to make any type of difference in a war effort? It seems that a film would weigh less than 30 pounds (and that is for an hour movie, and Melies' longest film appears to be 44 minutes). Even if all 500+ films were destroyed, this would only give (on the generous side) 15,000 pounds. I would figure the valuable commodity here is the silver, and I would expect there are not large amounts of it in film. I know all sort of odd things happen during war time, but why would the army destroy works of art just for the raw materials? Films at the time were generally considered to have little, if any, artistic value. Nor was it believed that they had any commercial value once they had been seen by the public. Thus, their only value lay in the materials and chemicals the film stock contained, a value which increased during the First World War when these and many other materials were in short supply. In 1917, his business office in the passage de l’Opera was requisitioned by the army, which seized approximately 400 films and melted them down in order to produce a chemical used in the production of boot heels – as has often been noted, this was a sad irony for the son of a shoe merchant. celluloid dental plates, harness trimmings, knife and cutler handles, emery wheels, brushes, shirt cuffs and collars, shoes, piano keys, and a vast range of other items. With the onset of World War I and the resulting loss of industrial production and shortages of raw materials, requisitioning was common in all the European countries at war. Melies was by this time bankrupt and no longer producing films, his career derailed by his failure to adapt to changing tastes, the death of his brother and business partner and brother, and a series of bad business decisions. 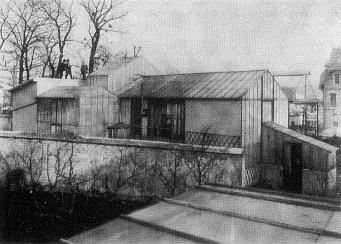 Photo source: cinemathequefroncaise.com Melies' studio in Montreuil was requisitioned by the French army in 1917 and turned into a military hospital. At the same time, about 400 of his films were melted down. were generally concerned with the preservation of films as a record of national or civic history.... The first National Film Archive formed as record of the film industry, rather than as a retrospective of public events, was...in Germany on 4 February 1935....The following year, Henri Langlois formed the Cinematheque Francaise from his own private film collection. Photo source: Un homme de tetes, 1898. A still from one of the many trick films which, at the time, was not considered worth preserving. 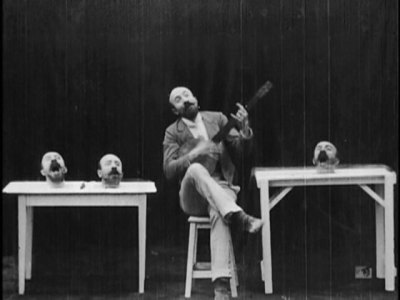 This 1898 film Un homme de tetes fortunately did survive. The film (about 1 minute long) can be viewed here. Sadly, Melies had destroyed his remaining films in 1923 as he had nowhere to store them. Likewise, most American studios destroyed most of their silent film archives: they saw no value in them, celluloid film was dangerous to store (see, for example, the 1937 Fox vault fire) and the studios needed the storage space. Consequently, it is estimated that 75% of all American films made before 1930 are lost forever. As with almost all other films of the period, Melies’ collection of studio-bound trick and scifi / fantasy films were seen to have little or no commerial value once they had been seen by the public, even though they were hugely popular in the late 1890s and early 1900s. There were no TV or cable companies these films could be sold to after their initial release. Not the answer you're looking for? Browse other questions tagged france world-war-one movies or ask your own question. Why did the French sell Louisiana? Why did the French nobility adopt Calvinism? Did British measures cause starvation in Norway during WWI? Why wasn't there more resistance to the French revolution by the army? How did the British Army unit size and structure in WWI change from 1915 to 1918? Why did the Allied attack at Gallipoli fail during WWI? Why were the Irish exempt from conscription during WWI? Did Serbian businessman Tadija Sondermayer serve in French Air Force Escadrille 3 during WW1? In 1916, did an amputee, invalided out of the French army, get a pension?